We LOVE to teach! Our instructors are confectionary enthusiasts just like you and thoroughly enjoy sharing and teaching everything we know. With a history of 50 years in the industry and over 100 years of combined experience in all things cake, candy and cookie related, we’ve got you covered. Click here to view and register online for our classes. 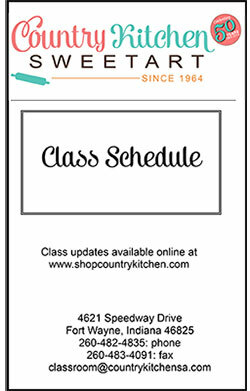 Click here for a printable class schedule. Country Kitchen SweetArt offers a variety of group classes that are fun and exciting for any group and for all ages (children and adults). A minimum of ten students is required to schedule a group class, and a deposit of $25 is required at the time of booking to secure the class date. A complete listing of our group classes along with detailed information can be found by clicking here. Make your birthday party extra special by celebrating and taking a class at Country Kitchen SweetArt! You and your friends will have fun making an assortment of edible treats. Each student will make a painted chocolate sucker, decorate a cookie, and decorate a jumbo cupcake. Parents can relax and enjoy the party while our staff takes care of all the class preparation and cleanup. Recommended for ages 3 to 103. Click here for more details. Register for classes online, or complete and mail the registration form. Please note, full payment is required at time of registration to reserve class space. We do not hold classes without payment. Registrations are processed in the order they are received. A minimum of one week advanced registration is required to receive regular class price and to ensure class is held. We realize that cancellations sometimes occur. If your cancellation is made 5 business days or more prior to the class, we will happily give you a full refund or apply the fee to another class. Payment is non-refundable and non-transferable if cancellation is requested less than 5 business days prior to class. Cancellation and refund policy for Creative Kids SweetArt classes vary from policy above. Please see Kids Classes for cancellations and refund policy. Country Kitchen reserves the right to cancel a class due to insufficient enrollment. A full refund will be issued if Country Kitchen must cancel a class due to low enrollment or due to inclement weather. Students registered in our adult classes receive a 10% discount coupon on regularly priced items. Coupon is valid for one total purchase within two weeks following class. Some classes end after our store is closed for the day. We make every effort possible to allow for shopping time after our evening classes, although the store is closed to the general public. However, there are times when we are not able to do this. We apologize for any inconvenience this may cause. Classes list in the description if the store is open or closed after class to help plan your shopping time. A couple of times a year, we have exciting, memorable events. View our class schedule above for upcoming events. Our most popular event is our Taste of the Holidays. During this annual event held mid-November, our classroom is filled with treats. Check out our recipe book from our 2017 Taste of the Holidays. Join us Sunday, August 26, 2018 for a special day of demonstrations and fellowship. Click here for the registration form for the ICES meeting. Autumn Carpenter, co-owner of Country Kitchen SweetArt shot a Cookie Decorating Craftsy video! Are you familiar with Craftsy? If not, check it out! It is an awesome resource for professionally shot online instructional videos. Click the image to receive 25% off her class! 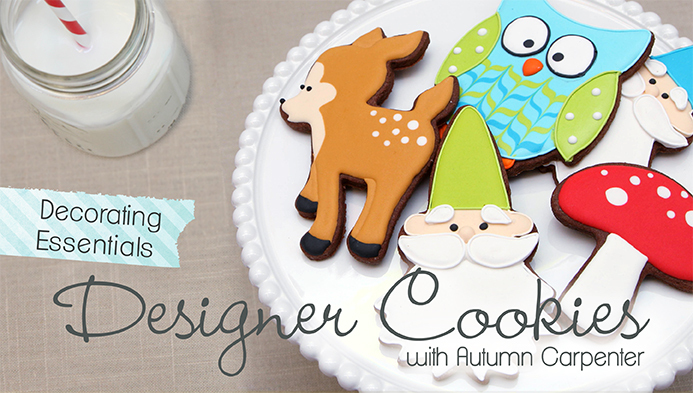 Use this link to receive 25% off (or more) Autumn's Cookie Decorating class! Shop for products from Autumn's Cookie Decorating class!